SOPA, PIPA Blackout Results | URimagination, Inc.
Google’s dropped its logo-shroud, Wikipedia’s returned from limbo, normal service in general has been resumed and all’s right with the world…except that SOPA and PIPA are still looming on Capitol Hill. So did yesterday’s blackout protests against these bills have an actual impact? Wikipedia’s Jimmy Wale certainly thinks they did. 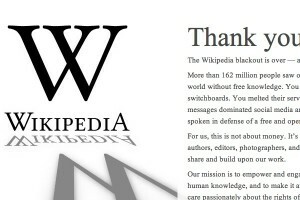 He’s taking a victory lap today, after blacking out the world’s fifth most trafficked website for 24 hours to raise awareness of the bills, offering a “thank you” message to supporters that claims over 162 million people saw Wikipedia’s anti-SOPA, anti-PIPA message. 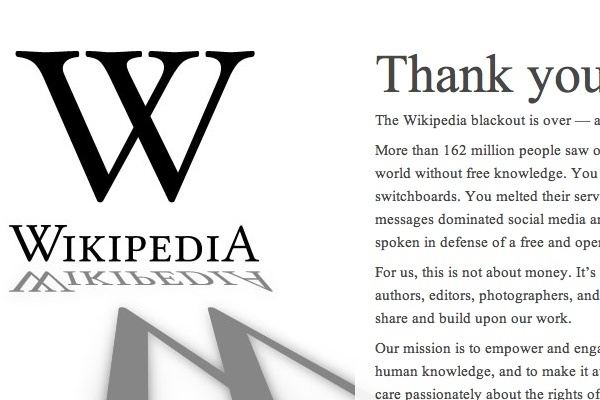 On Wikipedia’s SOPA Initiative/Lean More page, the site notes that over 12,000 people commented on the Wikimedia Foundation’s post announcing the blackout — ”A breathtaking majority supported the blackout.” On Twitter, Wikipedia says the hashtag topic #wikipediablackout “at one point…constituted 1% of all tweets,” and that SOPA-related Twitter posts were popping off at a rate of a quarter-million every hour. And finally: Wikipedia says over eight million visitors used the site’s zip code tool to look up their elected representatives. All the traffic to Congressional websites definitely had an impact: At one point Senator Ron Wyden (D-OR) tweeted “Anti- #PIPA, #SOPA traffic has temporarily shut down our website.” Other Congressional websites were reportedly slow to load throughout the day or returned error messages for visitors. The Progressive Change Campaign Committee, a PAC that claims over 850,000 members, said that over 468 PCCC-member websites (small businesses, web programmers, etc.) were blacked out for the day, that nearly 210,000 people had signed the PCCC’s petition urging that Congress reject PIPA/SOPA, and that over 30,000 Craiglist members had used the PCCC’s site to contact Congress about SOPA/PIPA. On the flip side, many were startled to find Wikipedia’s site unavailable yesterday and used Twitter to vent. Twitter account @Herpderpedia (warning, language) retweeted messages from users shocked or angry they couldn’t access the online tome (directly, that is — its content was still available).